Walking the dog is a lovely excuse to go garden watching. Lately I have been walking at night and love the way the daffodils literally shine like golden bells in the evening light. 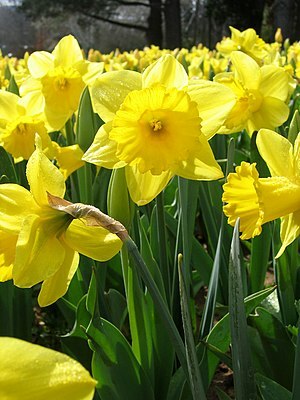 While the rest of the plants are just dark blobs, the daffodils are very clearly seen. While Moon gardening, as we know, does not literally mean gardening by moon light. I do so love the way that the daffodils shine in the evening! This entry was posted on September 20, 2010, in Moon Gardening. Bookmark the permalink.